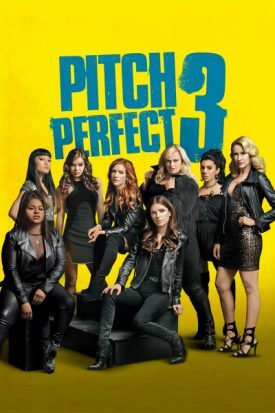 Pitch Perfect 3 is the third installment in the musical comedy series about a cappella and the bonds of sisterhood. If you enjoyed the other two and want one last hurrah with the Bellas, then you should embrace your inner completionist and seek this out. And, even if you’ve never cared for this series, I would still recommend it purely to watch the film morph from a generic comedy into a ridiculous action film. No I’m not kidding. This film sees the Bellas reunite post-graduation to take part in an international USO tour and encountering rival groups Evermoist (yes you read that right) and other unimportant bands, who all use actual instruments! The goal: to to impress and open for DJ Khaled (playing himself). However, things get complicated with the intro of Fat Amy’s (Rebel Wilson) criminal father (John Lithgow sporting a horrid Aussie accent), who essentially forces the movie into a bizarre (yet still enjoyable) direction. John Michael Higgins and Elizabeth Banks also appear as the sexist announcers, this time following the Bellas around for a documentary. Because of course they are. This is a bad movie. Most of the musical numbers feel forced and aren’t memorable like previous entries. The comedy is self-mocking, almost as if the film was originally supposed to satirize the formula before being overhauled, and the final 3rd becomes a Rebel Wilson Action Movie. I don’t know who made this decision, but I would like to personally thank them for doing so. Pitch Perfect 3 is both a beautiful aca-tastrophe and a passable swan song to fans of the franchise. The musical sequences should get the toes tapping, but the plot and characters are hilariously thin and the final act was clearly rewritten to get more buts in seats. It’s time to close the aca-curtains on this series, while it still has a shred of dignity left.